Devasuram (Malayalam: ദേവാസുരം; English: Of a god and demon) is a 1993 Indian Malayalam-language drama film, directed by I. V. Sasi and written by Ranjith. It stars Mohanlal, Revathi, Nedumudi Venu, Innocent, Napoleon, V. K. Sreeraman, Manian Pillai Raju, and Augustine. The songs featured in the film were composed by M. G. Radhakrishnan, while S. P. Venkatesh composed the background score. The rivalry between Mangalassery Neelakantan (Mohanlal) and Mundakkal Shekaran (Napoleon) forms the main theme of the film. The character Neelakandan was created by Ranjith, based on a real-life person named Mullasserry Rajagopal, who died in 2002. Devasuram is one of the highest-grossing Malayalam films of the 1990s. It is generally considered as one of the best films of Mohanlal and I. V. Sasi's careers. The film ran for more than 150 days in the cinemas. It was followed by a sequel, Ravanaprabhu (2001), which was writer Ranjith's directorial debut. The film was remade in Telugu the same year as Kunti Putrudu, with Mohan Babu and Vijayashanti playing the lead roles. Neelakantan (Mohanlal) is the spoilt heir to the well-known Mangalassery family. He squanders away his father's largess and good name, but is loved by the people who know him well. He has been the arch-rival of Shekaran of the Mundakkal family since childhood. During a minor ruckus, one of Neelakantan's aides accidentally kills Shekaran's uncle (Janardanan). This incites Shekaran to plan to avenge the death of his uncle. Meanwhile, Neelakantan offends Bhanumathi (Revathi), a talented Bharata Natyam dance graduate, by forcing her to dance in front of him in his house. In retaliation, Bhanumathi quits dancing and curses Neelakantan for desecrating the art so dear to her. Later, he feels regretful and helps her family in many ways and tries to persuade Bhanumathi to take up dancing again, but she doesn't budge. Meanwhile, Neelakantan visits his widowed mother intending to bring her back home, but she passes away after revealing a terrible secret; that he was born of another man, out of wedlock. This fact crushes him, and only Bhanumathi finds out this secret when he curses drunkenly (at the car of his deceased "father") that the ancestral heritage which he is proud of, is actually not his. She is surprised by the vulnerable side of Neelakantan. He visits Banumathi at her home to persuade her to take up dancing again, only to be refused like before, telling him that she will resume dancing only after his death. That night while returning home from the visit, Shekaran and his aide's ambush (by hitting him with a car from behind) and injure him seriously after also inflicting several wounds with swords and wooden sticks. Neelakantan survives the attack, but his left hand and right leg are badly injured and as a cure he undergoes Ayurvedic treatment to rejuvenate his legs. It is during this time that Bhanumathi falls in love with him (she is also regretful for having cursed him, feeling a bit guilty that the attack was somehow related to her curse). Neelakantan convinces Bhanumathi to dance and he arranges for a dance event for her at Delhi. He too loves her ardently, but he refuses to marry Bhanumathi considering her future, but in the end, she and Warrier (his elderly right-hand man) persuade him to do so. Neelakantan tries to forget all the past events and his rivalry with Shekaran, but Shekaran is not satisfied and wants to defeat Neelakantan in front of the whole village. For this, he kidnaps Bhanumathi and forces Neelakantan to take blows in front of the public during a village festival organized by the Mundakkal family. Meanwhile, Neelakantan's friends rescue Bhanumathi and after this, Neelakantan mauls Shekaran badly and cuts off Shekaran's right hand, claiming "Shekeran, I want to live peacefully..." so that he will not again come up with revenge later. However, while severing Shekharan's right-hand, Neelakandan uses the back side of the sword, which shows the agony and power he had. The protagonist Mangalaserry Neelakandan (Mohanlal) is a real-life character sketch of Mullasserry Rajagopal (died 2002). Supposedly, some notable scenes in Devasuram are real-life incidents. Varikassery Mana near Ottappalam was selected to portray the ancient Mangalaserry house. "It was only after Devasuram became a hit that producers and directors began to queue up for this location. Until then only one film was shot here," says Murali, one of the managers of the mana.. The action-packed climax scene of the movie was shot entirely in Pariyanampatta Bhagavathi Temple. "There were [also] powerful business interests at work when I wrote my hits such as Devasuram, Narasimham, Ravanaprabhu and so on...", said writer Ranjith. The film includes songs written by lyricist Gireesh Puthenchery and composed by M. G. Radhakrishnan. Background music was composed by S. P. Venkatesh. The songs became chart-busters. Mohanlal has rendered his voice for some songs as its intro. The song "Vande Mukunda Hare" is picturised on Oduvil Unnikrishnan, and is considered the most dramatic scene in the film. Though Oduvil Unnikrishnan plays only a small role, it was his performance that got the most applause. He plays the role of a wandering Edakka musician who frequently visits Neelakandan. The Edakka featured in the background of the song is played by Tripunithura Krishnadas. Devasuram was followed by a sequel, Ravanaprabhu, in 2001. 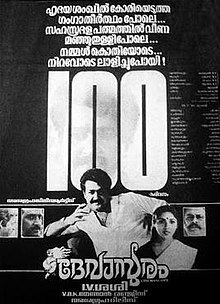 Because of the success of this film, a number of movies of the same genre (called thampuran movies) were made, but only three of them, starring Mohanlal — Aaraam Thampuran (1997), Narasimham (2000) and Ravanaprabhu (2001) — were blockbusters. ^ "An award in the name of a music lover". The Hindu. Chennai, India. 8 September 2007. ^ "Spirit - The Times of India". The Times Of India. ^ "10 Mohanlal films to watch before you die - The Times of India". ^ a b c d "An award in the name of a music lover". Chennai, India: The Hindu. 8 September 2007. Retrieved 8 April 2011. ^ "Theyre shooting like hell at Varikkassery Mana". 29 May 2012. ^ Nagarajan, Saraswathy (7 October 2011). "When money talks". The Hindu. Chennai, India. ^ ", Songs, Download songs by . Raaga.com Malayalam Songs - Raaga.com - A World Of Music". ^ K. Pradeep (1 April 2011). "Edakka NOTES". Chennai, India: "The Hindu". Retrieved 8 April 2011. ^ "Painting a portrait of love - Section: The Shooting of Ravana Prabhu". The Hindu. 2001-07-18. Retrieved 2011-02-03.